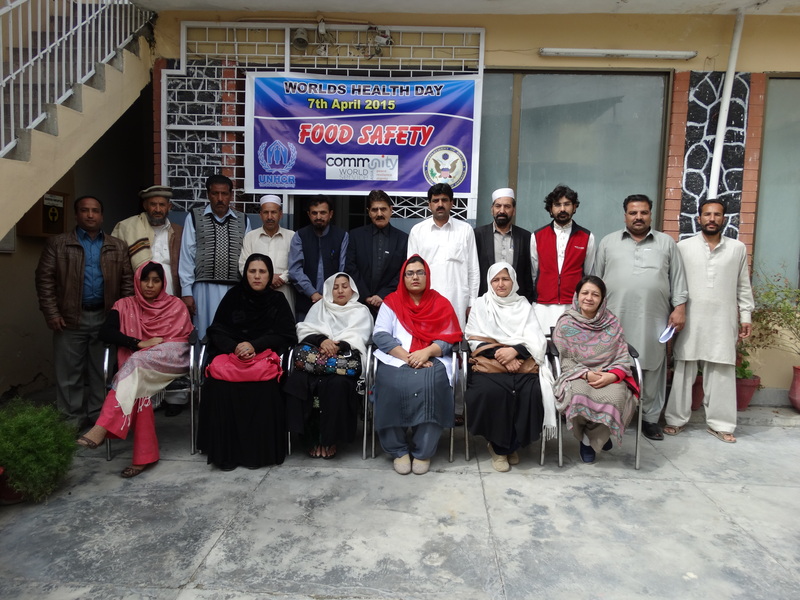 An awareness session on food and water hygiene was held in the Community World Service Asia Mansehra office and in three of its Basic Health Units in Barari, Khaki and Ichrian in celebration of the World Health Day on April 7, 2015. The discussions of the day were centered on the importance of consuming hygienic food. Community members were made aware of the many food borne illnesses that are prevalent due to lack of proper food management and unhygienic nutritional consumption. Health experts from the MNCH Project team physically demonstrated the difference between hygienic and unhygienic food. They displayed how some food may appear to be safe for consumption but actually would not be. They taught ways of how community members could identify these food contaminations that otherwise go unnoticed, and sanitize their sustenance in a way that would make it safe for their consumption. As this year’s World Health Day’s international theme was “food safety”, the activities conducted in Mansehra focused mainly on the emerging health problems and diseases caused by unhygienic food consumption. A great emphasis was laid on the considerable amount of improvement in living conditions of communities if all individuals started being conscious of food safety. The team based their awareness sessions on WHO’s guidelines on safer food and on how community members must incorporate these in their homes and villages. The five key points of the guidelines were to keep clean; to separate raw food from cooked food; to cook food thoroughly, to keep food at safe temperatures and to use clean water and cooking utensils. Community World Service Asia celebrated the World Health Day to promote the “FROM FARM TO PLATE, MAKE FOOD SAFE” global campaign in an effort to streamline food safety through its projects and among the communities it works with.